Let Lawns Unlimited illuminate your property with beautiful lighting that will make you stand out from your neighbors! Landscape lighting is one of the most visually pleasing upgrades that you can add to your property. Not only does it make your home or property look great, but landscape lighting also helps keep the area well lit during the dark hours and is proven to help prevent unwanted intruders or pests. Lawns Unlimited can install your low-voltage lighting system in and around your property. From garden beds, trees, shrubs and even lighting up your home, we have the ability to do it all. Get in contact with us and find out how we can help light up your property! Curious on how we can help illuminate your landscape? Lawns Unlimited can assist with any type of landscape lighting that you might need. Below are some of the places we can make your property beautiful. We can light up the well, bullet, flood or install downlight. Have a few or all of the trees on your property lit beautifully. Show off your beautiful plants and flowers. Illuminate around your entrances or light up the sides and corners of your home for a beautiful look. Light up the walls around your garden to help it stand out at night and show off your garden. Light up specific parts of your lawn, property or accents. You’ll stand out with customized focal points. Why Wait? Get Your Complete Landscaping Lighting Done Right! 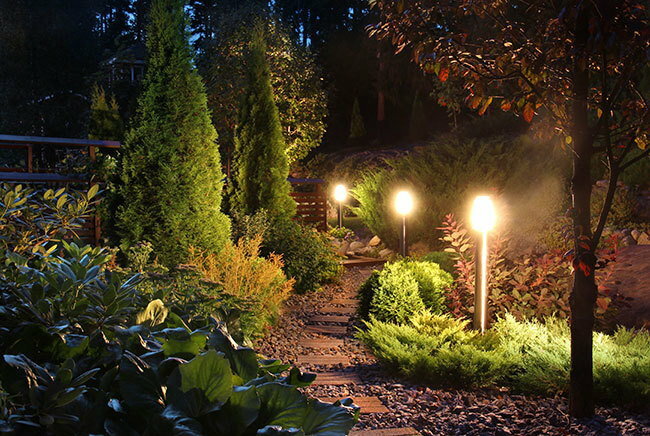 At Lawns Unlimited, we have the ability to install a complete landscaping lighting solutions. We will walk you through the entire process and will help you stand out more than anyone else! Get in contact with us below to get started.